$7.99 US / $8.99 Can. thirty-fourth in line for the throne—and flat broke.From the Agatha Award-winning author of the Molly Murphy and Constable Evan Evans mysteries!Lady Victoria Georgiana Charlotte Eugenie, 34th in line for the throne, is flat broke. She’s bolted Scotland, her greedy brother, and her fish-faced betrothed for London. The place where she’ll experience freedom, learn life lessons aplenty, do a bit of spying for HRH—oh, and find a dead Frenchman in her tub. Now her new job is to clear her long family name. Rhys Bowen has been nominated for every major award in mystery writing, including the Edgar®, and has won seven, including both Agatha and Anthony awards. She is also the author of the Molly Murphy Mysteries set in turn-of-the-century New York, and the Constable Evans Mysteries set in Wales. She was born in England and lives in Northern California. It’s 1930 and Georgie (Lady Victoria Georgiana Charlotte Eugenie, to be exact) is royalty, of a sort. Only 33 other royals stand between her and Britain’s throne. She has been taught to be a good hostess and wife, but not much else. Penniless, she has been living with her husband and his wife, but when her brother cuts off the pittance he called an allowance, she heads to London to try to find work. When she doesn’t last an entire day at Harrods, Georgie decides to open a maid service. But when she finds a man drowned in her bathtub, she’s so busy trying to clear her brother’s name that she doesn’t have time to run her new business. Her Royal Spyness is the first installment in Rhys Bowen’s A Royal Spyness series. The novel is set in 1930s Great Britain, making it not only a cozy British mystery, but also great historical fiction. Filled with eccentric characters and fun dialogue, this series promises to be a fan favorite. Do you love to read? You know I do! 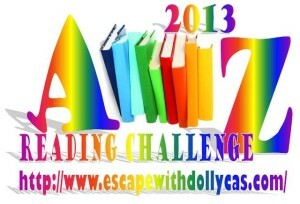 Escape with Dollycas Into a Good Book is hosting a reading challenge for 2013.This challenge will run from January 1st, 2012 until December 31st, 2013. You can join anytime. It’s an alphabet challenge!!! The challenge is to read one book starting with every letter of the alphabet. A - Make a list on your blog from A-Z. Throughout the year, as you go along, add the books you are reading to the list. Towards the end of the year, you can check and see which letters you are missing and find books to fit. B – Make a list now of 26 books, picking one for each letter of the alphabet. For example: A – The Azalea Assault B- Blue Monday C – Crops and Robbers D – A Deadly Grind etc. Sign up at Escape with Dollycas Into a Good Book and grab the button. Non-bloggers you can join too! Just keep track any way you wish and enter a link below if available or sign up in the comment section. You can even set up a special shelf on Goodreads to help you keep track! Need some help finding titles to match the alphabet – Jandy’s Reading Room has a wonderful list to get you started. I will be updating my list and will keep it posted on here. Check back to see what I’ve read, and comment and let me know when you join the challenge. Here’s to a year of good reading! This entry was posted in Uncategorized on August 10, 2013 by theselftaughtcook.